The solar industry estimates that solar installations will increase by 119 percent in 2016, growing by 16 gigawatts (GW) this year compared to 7.3 GW in 2015. This rapid rate of growth is being driven by subsidies such as net metering and the solar investment tax credit (ITC). Solar net metering is a state-level policy that requires utilities to pay customers for the excess electricity from their solar panels—almost always at the full retail rate. Net metering has certainly helped residential solar compete with conventional sources of electricity because of its huge advantages, such as shifting the costs of solar power to households that haven’t installed solar panels. However, it is far from being a free-market approach to electricity generation. Net metering, as currently implemented, is a subsidy that favors solar panels over the rest of the power sources on the grid. Below are some of the hard facts about the residential solar power industry—facts that present a more accurate picture of what some have called the “fastest-growing source of renewable energy in America”—and the policies like net metering that favor it. Myth #1: Rooftop solar is a cost-effective option for homeowners. Fact: Without large subsidies, rooftop solar fails to make economic sense. The most reliable estimates available indicate that electricity from solar panels is much more expensive than electricity from conventional sources like coal, natural gas, or nuclear. According to the non-partisan U.S. Energy Information Administration (EIA), the levelized cost of electricity (LCOE) for new solar photovoltaic (PV) technology will be $125.30 per megawatt-hour (MWh) in 2020. In contrast, EIA estimates the LCOE for new natural gas combined cycle plants to be $75.20 per MWh. Solar PV simply cannot beat new natural gas plants on cost. Furthermore, IER recently commissioned a study to supplement EIA’s estimates with the levelized cost of electricity from existing resources. The study found that existing coal power plants generated electricity for only $39 per MWh—about one-fourth of the cost of new solar electricity. IER’s study also found—in a brand new addition to the LCOE literature—that new solar PV actually costs $153.7 per MWh after factoring in the “imposed costs” placed on natural gas resources that are forced to back down to accommodate the intermittent output of solar PV on the power grid. Crucially, nearly all discussions of the cost of electricity leave out both the low cost of existing resources and the imposed costs created by intermittent resources. In the current market dynamic, with low-cost coal resources and very low natural gas prices, rooftop solar is only competitive because of large government subsidies, including the solar ITC and net metering policies. For instance, after Nevada reduced its net metering rates last December, rooftop solar companies—including SolarCity, Sunrun, and Vivint Solar—quickly exited the state. The rapid departure of these solar companies, from one of the states with the most sunshine, demonstrates that solar cannot survive without large subsidies. Myth #2: Rooftop solar is the future of electricity generation. Fact: The cost of solar panels has fallen, but solar power still faces the same reliability challenges that it has encountered over its 125-year existence. Advocates argue that solar power is relatively new and should be supported by subsidies, but it is far from the technology of the future. The development of solar cell technology began during the industrial revolution, and Charles Fritts installed the world’s first solar array in New York City in 1883. Despite the technology being heavily subsidized since the 1970s, solar power accounts for around 1 percent of total electric production in the United States. The same problems that plagued the industry 125 years ago are still around. Namely, the panels cannot produce electricity when the sun isn’t shining. Electricity must be produced and consumed simultaneously, so the only way to make solar a viable resource would be to pair it with an on-demand storage technology (for example, to install lots of expensive battery capacity), which remains unaffordable for both utilities and families. Unless both solar panels and batteries become much, much cheaper, solar will continue to be unaffordable. Fact: There are many times during the year when the sun has already set at peak demand. And as more solar power is added to the grid, the peak demand problem actually gets worse. According to California’s grid operator on March 8, 2016, peak demand in California occurred at 6:48 p.m.; however, the sun sets just before 6:00 pm. Solar power cannot help utilities manage their peak electricity loads when the peak load occurs after the sun has set. During the summer in California, for example, peak loads occur while the sun is still up, but during other times of the year the peak is frequently after the sun has gone down. These changing peak load times, combined with solar power’s intermittency, prevent rooftop solar from dependably meeting electricity demand. Perhaps counter-intuitively, the capacity value of solar power at times of peak demand actually falls as more solar panels are installed. In fact, it quickly falls to zero. That is because of the way additional solar power skews the net load curve, as we discuss below. Fact: Solar imposes additional strain on the grid and other electricity producers by creating a more uneven demand curve. One picture shows why this is a myth. The chart below is from California’s grid operator (CAISO) on March 9, 2016. The dark blue line shows actual demand throughout the day. 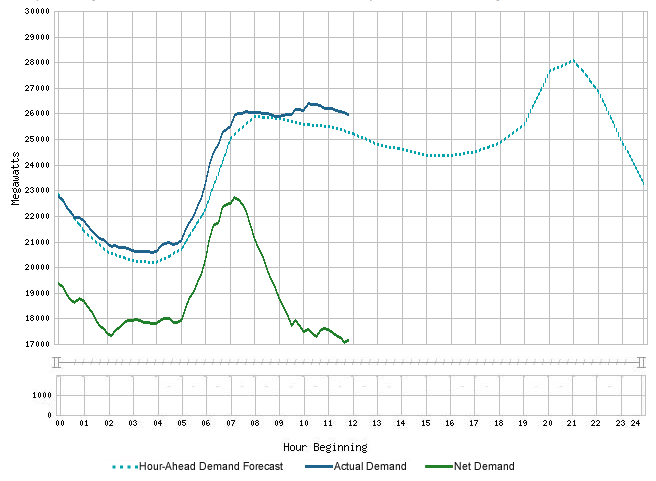 The green line show the net demand, or the electricity demand minus wind, solar, and other renewable resources. Clearly, the blue line is smoother and changes less drastically. Another important note from this chart is that solar—driven in large part by net metering—is making electricity generation less efficient. The most efficient sources of electricity generation are nuclear, combined cycle natural gas, coal, and hydro. With the exception of hydro, the other sources are most efficient when they run at near-constant output without large swings in electricity production. Because wind and solar are intermittent, the chart above shows electricity demand now has two demand peaks during the day, which means grid operators are forced to use more fast-acting (and less efficient) natural gas turbines to meet demand, rather than rely on more nuclear, combined cycle natural gas, and coal plants throughout the day. The real challenge for the electricity grid is the steep increase in net demand after 3:00 pm, when solar power fades in the afternoon just as electricity demand increases. This steep increase in production, as solar power fades and demand goes up, requires an unprecedented amount of “ramping” up and down each day, increasing the cost of the reliable resources doing the heavy lifting. Solar can be more helpful during summer months when the sun is still up during the highest demand periods of the day. But on days like the one shown in the chart above, solar shifts electricity production from more efficient and cost-effective sources of electricity generation (nuclear, combined cycle, and coal), to less efficient and more expensive sources of electricity generation (natural gas turbines). In other words, relying on backup generation to fill in the gaps created by wind and solar is inefficient and makes the demand curve less smooth. Specifically, net metering creates reliability problems because it requires the “distribution grid to be changed from a one-way delivery system to a complicated two-way network.” This two-way network can have unintended negative consequences on reliability. Since solar energy cannot ramp up or down on demand, grid operators have trouble balancing power generation if there’s too much solar. Solar energy causes periods of over-generation during the day, followed by steep ramping needs from conventional sources in the evening. This so-called “duck curve”—named for its shape— becomes more pronounced as more solar energy is added. Myth #5: Residential solar has achieved “grid parity” in many part of the U.S. Fact: Grid parity is a meaningless concept unless or until solar power becomes dispatchable. Sometimes described as the “break-even” cost for residential solar, grid parity is reached when an energy source becomes cost-competitive with electricity from the grid, which is primarily produced by conventional sources such as coal, natural gas, and nuclear power plants. However, the idea that renewable energy sources can achieve grid parity is meaningless, because renewable energy sources do not function like conventional sources such as natural gas, nuclear, or coal generation. Not all energy sources are created equal: dispatchable generation resources (e.g., natural gas) can produce power on demand, but non-dispatchable resources like solar vary based on weather and time of day. As the U.S. Energy Information Administration (EIA) explains, dispatchable power plants “generally have more value to a system than less flexible units,” including intermittent solar panels. Grid operators have to balance the amount of electricity being generated at any moment, so solar can actually make their jobs significantly harder. A recent study from Deloitte found that subsidies are critical for solar to reach grid parity in some parts of the country. If solar power is truly competitive on the grid (as those trumpeting grid parity suggest), it shouldn’t require continual government handouts. Instead, if solar power can compete with new natural gas power plants as well as existing coal, nuclear, and hydroelectric plants—the most economical power plants on the grid—then it’s time to remove solar power’s training wheels. However, as is evident from IER’s levelized cost study, solar PV remains uncompetitive on the grid, since solar electricity costs three or four times more than electricity from existing natural gas or coal. Fact: Completely disconnecting from the electric grid is costly and complicated. Going “off the grid” isn’t a realistic option for most homeowners. Leaving the electric grid behind isn’t as simple as just installing solar panels. Instead, going off the grid would require a great deal of new, expensive technologies (including sufficient battery storage) or limiting power consumption to match solar production during daylight hours. But these realities haven’t stopped solar companies from advertising their products as miraculous innovations: Elon Musk (Tesla CEO and SolarCity chairman) even argued, “You could actually go, if you want, completely off the grid,” using solar panels and battery packs. However, these rosy predictions don’t line up with the facts. IER analyzed the economics of using Tesla’s Powerwall battery alongside solar panels and determined that the payback period for such a set-up could be 31 years. Although energy storage could be useful in some contexts, Tesla’s battery also isn’t suited “to store daily household solar generation” on a consistent basis or to power the large appliances that Americans regularly use. According to a report on Seeking Alpha, the necessary components for an off the grid lifestyle would be solar panels, an inverter, a battery system, a charger or load manager, and an optional backup generator. While this may seem basic, the author argues that “design challenges are considerable and off-grid economics are highly questionable.” Additionally, researchers at the University of Sydney found that going off the grid isn’t likely to be an economical option, even considering future cost declines for solar panels and battery storage. Because of the high expense of battery storage and the intermittency of solar power, having a backup generator would be essential for many homes attempting to go off-grid. While fossil fuel-fired generators are the most useful for this purpose because they can be dispatched on demand, they might be an unattractive option for individuals trying to leave the grid for environmental reasons. In the end, going “off the grid” isn’t practical for most families who want reliable, affordable power. Myth #7: Residential solar is a key part of the movement toward a 100 percent renewable grid. Fact: Relying on 100 percent renewable energy is not economically feasible, and the companies making those claims are still getting the vast majority of their electricity from conventional sources. Huge businesses like Apple and Microsoft like to make people think their data centers or entire organizations are run off of renewable energy, but these claims are misleading. Ultimately, any household or company hooked up to the power grid receives the majority of their electricity from conventional sources; it’s simply impossible to separate renewable generation from the rest of the electricity once it’s on the grid. What these companies are doing instead is essentially an accounting gimmick that allows them to claim to be “100 percent renewable” while, in reality, they are using the exact same power mix as everyone else on the grid. Even if going “100 percent renewable” were possible, it isn’t economical yet and may never be. According to MIT Technology Review, as increasing amounts of solar are “added to the energy mix, the economics become increasingly unfavorable.” Solar power still provides less than 1 percent of electricity generation in the U.S., so the difficulties of integrating more and more intermittent power from the sun or the wind will only become more pronounced. Myth #8: The majority of subsidies for rooftop solar go to homeowners. Fact: Most subsidies go to multi-billion dollar corporations. The growth in residential solar is driven by third-party ownership model, where neither the electricity consumer (i.e., homeowner) nor energy producer (i.e., utility) owns the solar panel. Third-party financing is the dominant method to fund residential solar installations, consisting of 72 percent of residential installations in 2014. Arizona Attorney General Tom Horne released a consumer alert in June 2014 that warned against “unethical behavior” from solar companies, and Attorneys General in Louisiana, Mississippi, Connecticut, and Vermont have all warned consumers of the predatory tactics employed by the residential solar industry. Myth #9: Net metering benefits all Americans. Fact: Net metering subsidizes homeowners with solar panels, who are, on average, wealthier than homeowners without solar panels and significantly wealthier than families who do not own a home. The added costs shifted onto non-solar households can be substantial. In California, for example, Southern California Edison (SCE) projected a $16.7 billion shift onto non-net metering consumers, while Pacific Gas and Electric estimated a $24 billion shift over the next decade. San Diego Gas & Electric claimed that the non-solar customers pay about $160 million more annually because of net metering. For many families, purchasing solar panels simply isn’t feasible. The National Renewable Energy Lab (NREL) estimated, “49% of households are currently unable to host a PV system when excluding households that 1) do not own their building (i.e., renters), 2) do not have access to sufficient roof space (e.g., high-rise buildings, multi-unit housing), and/or 3) live in buildings with insufficient roof space to host a PV system.” The benefits of rooftop solar are concentrated because fewer low-income and middle-class families own their homes or have the resources to install solar panels. Fact: The savings from installing solar panels are either exaggerated or even negative. The residential solar industry makes claims about the supposed savings solar panels will deliver on monthly electricity bills, but these savings frequently don’t materialize or are overstated. In some cases, contracts with solar companies can cause electricity bills to increase. The Wall Street Journal reported that Paul Braverman, 79, signed a 20-year lease with Sungevity in 2013 because “he believed he would cut his overall utility payments.” In reality, he ended up paying about $800 more annually. Sungevity argued that he had been using much more energy than in the past, but data from the Arizona Public Service revealed that “wasn’t the case” and the solar company refunded Mr. Braverman $1,600. In another case, a class action lawsuit alleged that Sunrun deceptively based savings claims on its website on the assumption that utility rates would rise 6 percent annually, but data provided by Pacific Gas and Electric Co. showed that rates have leveled off since 2008. Furthermore, most solar contracts contain price escalators, meaning that monthly payments rise over the course of the contract regardless of a change in utility rates. Customers may be misled about energy-price escalators mandated in the contract, which could amount to a 5 percent annual increase in lease payments. Ultimately, customers pay nearly double the retail price of the panel over the course of their contracts, according to the Wall Street Journal. Residential solar power is growing rapidly, particularly because of the prevalence of policies like net metering. But while proponents of solar power are reciting a number of claims that sound too good to be true, we offer facts that tell the real story behind the myth. What the net metering discussion needs now is critical analysis—of the claims made by solar companies, the reliability problems associated with solar power, and the high cost of rapidly increasing the amount of solar power on the grid. Such analysis is essential to making rational decisions when it comes to household energy investments and state and federal energy policy. IER’s Travis Fisher, Mark Febrizio and Matthew Sabas contributed to this report. These numbers are from a forthcoming update to IER’s LCOE-Existing study. For the original report, see: Tom Stacy and George Taylor, What is the True Cost of Electricity?, Institute for Energy Research, June 30, 2015, https://www.instituteforenergyresearch.org/analysis/what-is-the-true-cost-of-electricity/. Solar Energy Industries Association, Net Metering, http://www.seia.org/policy/distributed-solar/net-metering. California ISO, Renewables Watch, Mar. 8, 2016, http://content.caiso.com/green/renewrpt/20160308_DailyRenewablesWatch.pdf. The capacity value of solar is discussed in IER’s forthcoming report. Also see, EnergySkeptic, Capacity value of solar is low as penetration increases which could suppress investment, June 5, 2015, http://energyskeptic.com/2015/capacity-value-of-solar-is-low-as-penetration-increases-which-could-suppress-investment/. See conversation starting at 8:50, Alex Epstein, Power Hour: Travis Fisher on the 100% Renewable Scam, Center for Industrial Progress, February 5, 2016, http://industrialprogress.com/power-hour-travis-fisher-on-the-100-renewable-scam/.